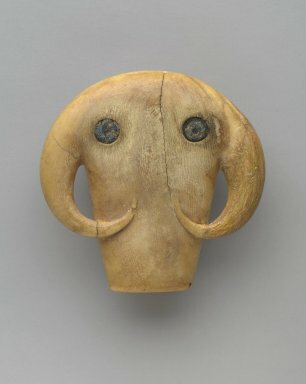 Ivory head of a cow, probably used as an amulet as the back is bored for suspension. The eyes are very round and are inlaid with a dark material. The two horns curve around and end in delicate points on the face. The face is highly stylized. The ivory has taken as a deep brown tone. Condition: The right horn is missing. There is a crack on the center of the face.